Thermal transfer ribbons contain wax and wax~resin blend ink. Heat is applied to the ribbon using a thermal print head that melts the ink transferring it to plastic~paper labels or card stock where it attains degrees of permanence after it has cooled. 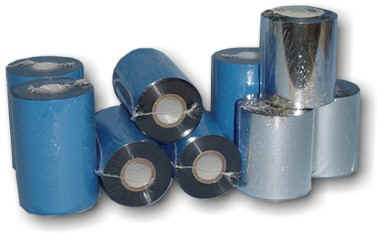 A typical thermal transfer ribbon consists of three layers: the plastic carrier film, the heat melting ink, and the coating on the print side of the to be printed on material. The coating and plastic film help keep ink from adhering to the print head which can cause poor print quality. Ribbons are available in black, blue, red, green, and yellow. It is recommended the print head be cleaned between each ribbon change with a cotton swab and isopropyl alcohol to prevent wax or wax~resin build up. Click Here to tell us what your ribbon requirements are.